For several years, Lewis Larsen has been prolific in his written communications about his and Allan Widom's theory of ultra-low-momentum, neutron-catalyzed, low-energy nuclear reactions. 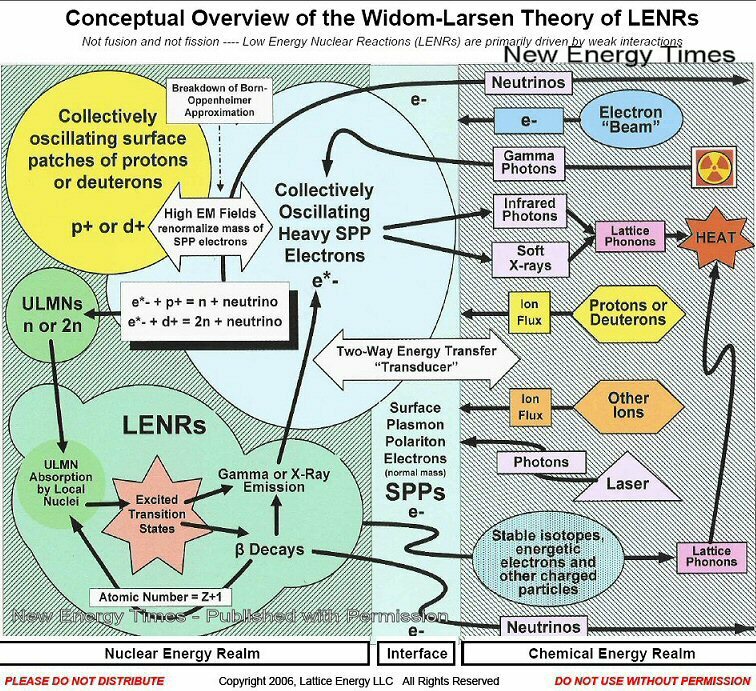 Most of Larsen's science papers, news articles, and slide presentations are listed on the New Energy Times Widom-Larsen Theory Portal. This article will present the simplest possible overview of the Widom-Larsen theory of LENRs. In order to keep this article as concise as possible, I will begin it at a level that assumes readers have some basic understanding of nuclear physics. 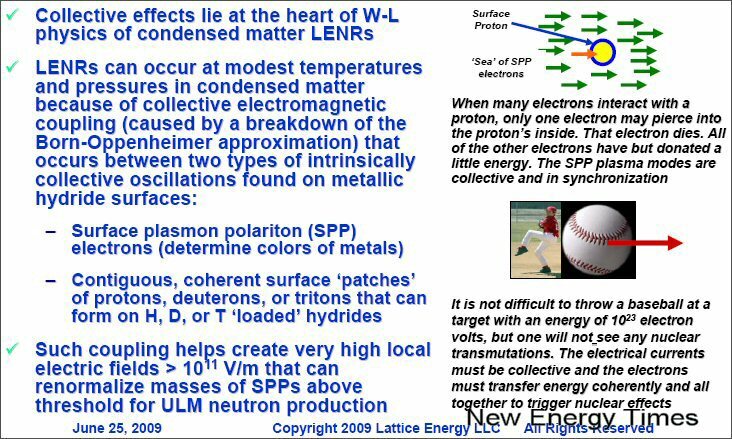 This article will also go relatively quickly from simplicity to a highly complex overview of the potential implications and applications of not only the Widom-Larsen theory but also of LENR. Electromagnetic radiation in LENR cells, along with collective effects, creates a heavy surface plasmon polariton (SPP) electron from a sea of SPP electrons. An electron and a proton combine, through inverse beta decay, into an ultra-low-momentum (ULM) neutron and a neutrino. 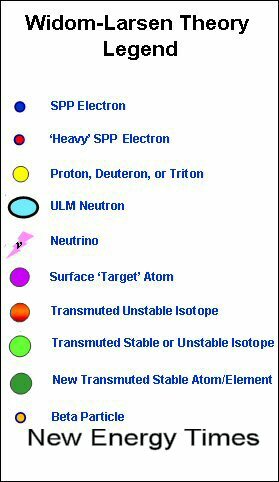 That ULM neutron is captured by a nearby nucleus, producing, through a chain of nuclear reactions, either a new, stable isotope or an isotope unstable to beta decay. A free neutron outside of an atomic nucleus is unstable to beta decay; it has a half-life of approximately 13 minutes and decays into a proton, an electron and a neutrino. When an unstable nucleus beta-decays, a neutron inside the nucleus decays into a proton, an energetic electron and a neutrino. 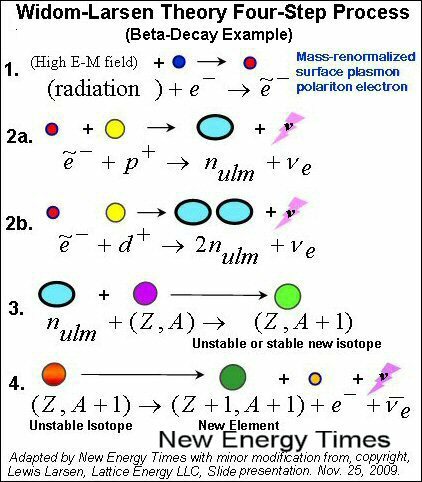 The energetic electron released in a beta decay exits the nucleus and is detected as a beta particle. Because the number of protons in that nucleus has gone up by one, the atomic number has increased, creating a different element and transmutation product. Given that the fundamental basis for the Widom-Larsen theory is weak-interaction neutron creation and subsequent neutron-catalyzed nuclear reactions, rather than the fusing of deuterons, the Coulomb barrier problem that exists with fusion is irrelevant in this four-step process. The most unusual and by far the most significant part of the Widom-Larsen process is step 1, the creation of the heavy electrons. Whereas many researchers in the past two decades have speculated on a generalized concept of an inverse beta decay that would produce either a real or virtual neutron, Widom and Larsen propose a specific mechanism that leads to the production of real ultra-low-momentum neutrons. Figure 3: Larsen's explanation of the four-step process. 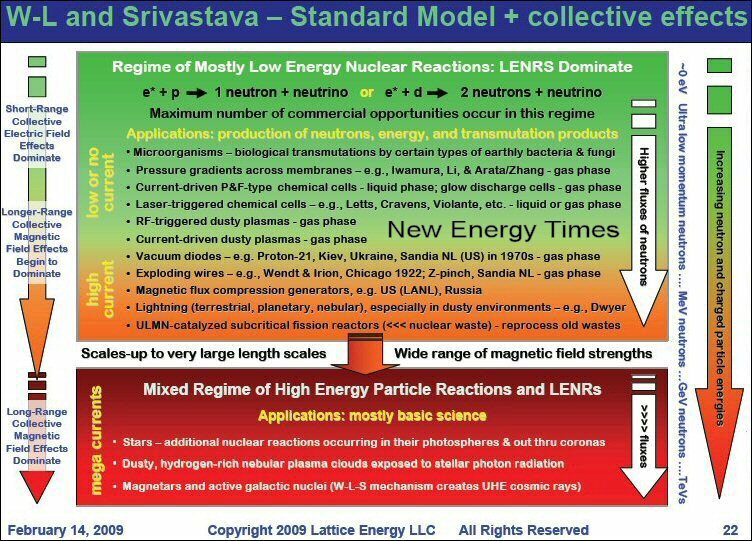 At the heart of the mechanism for step one is a new understanding of the behavior of collective effects in LENR. As a metaphor, Larsen discusses how a flock of geese can travel through turbulent storms while two or three geese alone would not get through. The geese take advantage of the collective effects of, among other things, their group aerodynamics. In a similar way, Larsen envisions a sea of surface plasmon polariton electrons working collectively on the surface of metallic hydrides in LENRs to create heavy SPP electrons. His slide below provides more detail. (Source: New Energy Times) Now let's broaden the picture and take a wider view of LENR from Larsen's perspective. 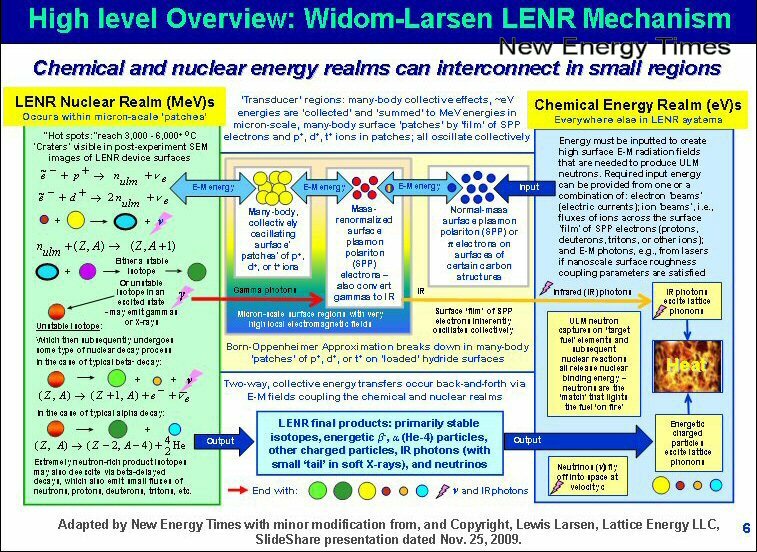 In 2006, Larsen created a visual diagram, "Conceptual Overview," of LENR. In this single slide, he shows the wide variety of inputs, outputs and processes in LENR systems. The four-step mechanism, according to the theory, can explain the production of most of the LENR phenomena that have been reported for the last two decades: helium-4, helium-3, tritium, heavy element transmutations and much more. (Source: New Energy Times) According to the Widom-Larsen theory, no large fluxes of high-energy neutrons will be emitted from LENR cells – exactly what has been observed for two decades. 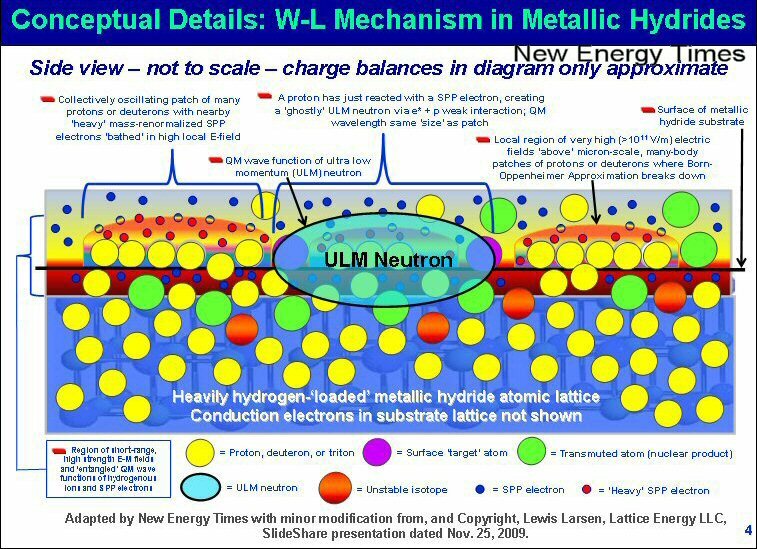 Nearly all the ULM neutrons are absorbed locally because they do not have enough energy to travel beyond the immediate reaction site. The theory also proposes that lethal photon radiation (gamma radiation), normally associated with strong interactions, is internally converted into more-benign infrared (heat) radiation by electromagnetic interactions with heavy electrons. Again, for two decades, researchers have seen little or no gamma emissions from LENR experiments.